Maharashtrain women get up early in the morning, shower and then prepare a wholesome Mahrashtrain Breakfast. Planning of what Maharastrian Breakfast food to have is done the previous night. Breakfast is planned based on what the family likes. Kids love some sweet Maharashtrain Breakfast Dish like Rava Sheera while adults prefer to go for healthy options. Thalipeeth is one of the healthy breakfast options made of 3 flours, besan, jowar and whole wheat flour and served with super healthy homemade white butter. 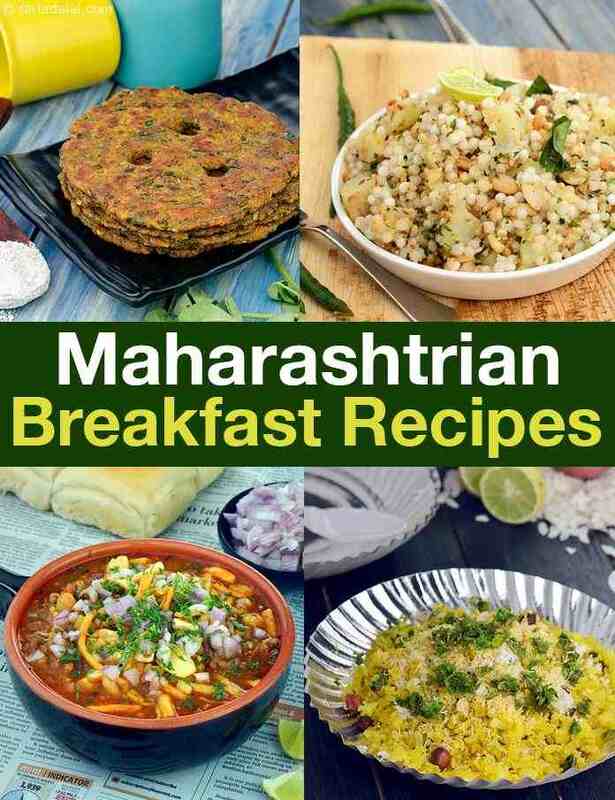 What's the most popular Maharashtrain Brakfast Recipe? The most common breakfast in almost all Maharashtrian home is spicy Kanda-Poha, which is made by adding roasted peanuts, boiled/ fried potatoes. Garnishing fresh coconut in grated form and lemon juice add superb taste to it. Maharashtrian do not believe in wasting food made at home. The leftover chapatti, bhakri (Jowar, rice, bajara) or cooked rice for Fodni cha bhaat plays important role in next day breakfast, Spicy and delicious chivda (Manora) is made with it. Vegetable like capsicum, potatoes, green peas is added to this chivda. Hot and spicy chapati, bhakri chivda (Manora) is finished in very few minutes during breakfast. Puneeri MISAL is loved by everyone with ladi-pav. Puneeri Misal has originated from Pune and is the nickname for misal in all small tea stalls or Taporis in Maharashtra costing Rs 20 only. Misal is enjoyed in spicy usal with sprouts like moong, green peas and math. Multigrain Dapata, Dashmi is enjoyed with Lemon or mango pickle or Coconut-garlic chutney. During the fasting day, Sabudana khichdi, vaari chi bhagar, boiled potato-peanuts Usal, sabudana thalipeeth, sabudana vada is made in breakfast. Maharashtrian also enjoys garama garam palak pakoda, kandabhaji, potato bhaji with poori, dal vada with hot morning tea/ coffee or masala milk. Maharasthrians love their morning Chai. Chai is had on its own or in the following combinations.